Before we go on a summer break, we would like to draw your attention to the #indiebookchallenge. Introduced in March 2018, it offers weekly challenges around books made by independent publishers. You can join in any time – why not over the summer break?! The “indiebookday” (link to website) was established in 2013 in German-speaking countries and then spread to the UK, the Netherlands, Italy, Portugal and Brazil. 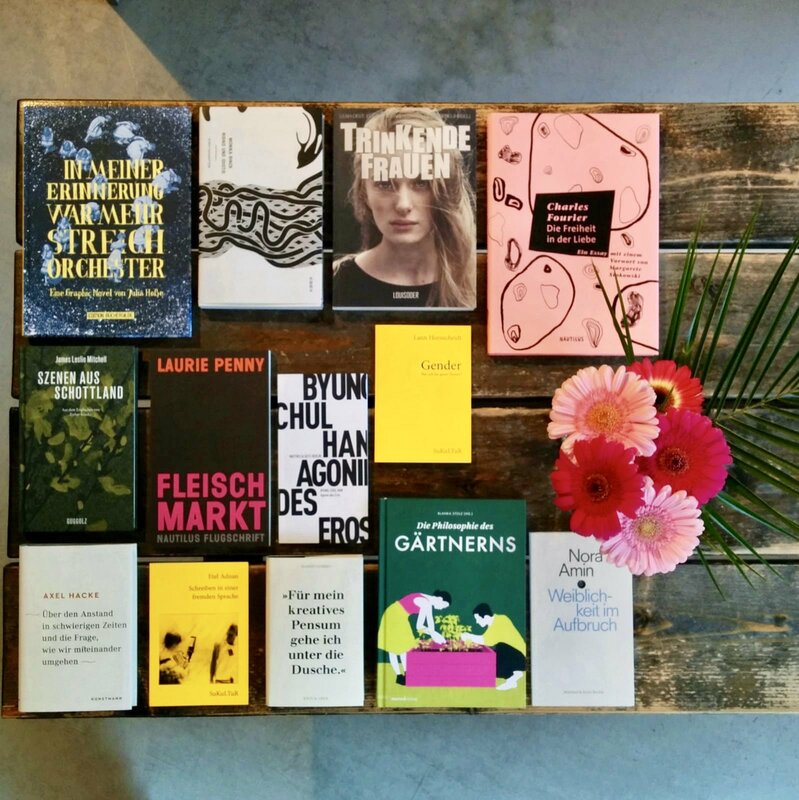 The indiebookday in March is an occasion to celebrate books published by independent publishers – in bookstores, readings, at home or online. 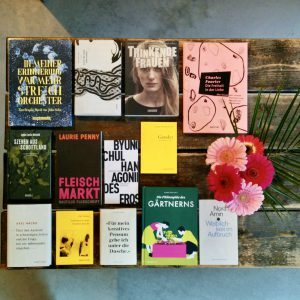 In 2018, the “indiebookchallenge” (link to website) – after an idea from Sarah Käsmayr, Maro Verlag – was introduced. The challenge sets little tasks for each week of the year, to be completed by reading books published by independent publishers that meet the criteria of the task. However, you can also just go see what your local bookstore or library has in store for the weekly challenge, or recommend books that you deem fitting. I think the aim is to talk or write about these books, even if you don’t manage to read them all. But what do the tasks look like? This week’s task, for example, was to read a book with a fruit in the title. Other challenges included a book that is not set on planet earth (5.5. ), a bilingual book (2.3. ), a book published in the ‘Arab world’ (21.4. ), a book only published electronically (22.9. ), and a book with 14 letters in its title (28.4.). Many publishers, literature venues, bloggers etc. offer their own recommendations for the respective week(s) and the initiative’s website lists a number of book people who each present a week’s task (e.g. 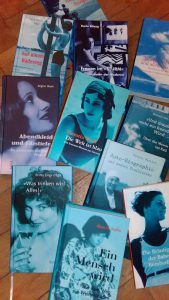 the indie AvivA Verlag presented the first challenge: books with blue covers). The aim of the indiebookchallenge is to encourage people to ask for indie publishers and books, create more (media) attention for indie books and celebrate the many incredible publications off the beaten track. Sarah Käsmeyr’s idea was discussed during a meeting of indie publishers in Düsseldorf with the Arts Foundation in North Rhine-Westphalia earlier this year. One of the results of this meeting is the “Düsseldorf Declaration”. Its aim is to introduce arts funding for independent publishers (similar to other forms of arts funding that already exist, e.g. for some theatres) and develop a strategy to show a general audience that they don’t want to live in a world without indie publishers. So the indiebookchallenge fits right in. As this challenge goes on for 52 weeks, this promises a longer lasting effect. In a different corner of town, Maria-Christina Piwowarski runs ocelot – not just another bookstore. She reports that her customers have shown interest in the indiebookchallenge-themed displays and their feedback about the weekly recommendations has been very positive. See and judge for yourself if the indiebookchallenge might be something you enjoy – or even something you might want to export to some other literary field. But for now, enjoy the summer break and find us back at the end of September! More information about the “Düsseldorf Declaration”: Link to an article in “Boersenblatt” and link to an article in “Buchmarkt” (both in German).